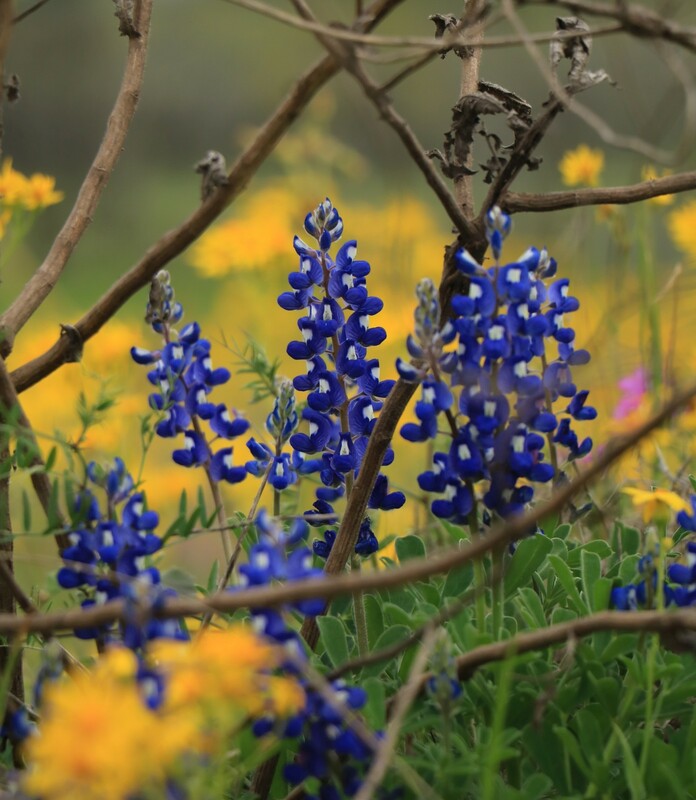 Three primary components of Texas’s famous spring floral displays — red Indian paintbrush, yellow ragwort, and bluebonnets — often cover the landscape with grand, monochromatic sweeps of color. The fields are dramatic and beautiful; they draw visitors from across the state and beyond to exclaim over them. 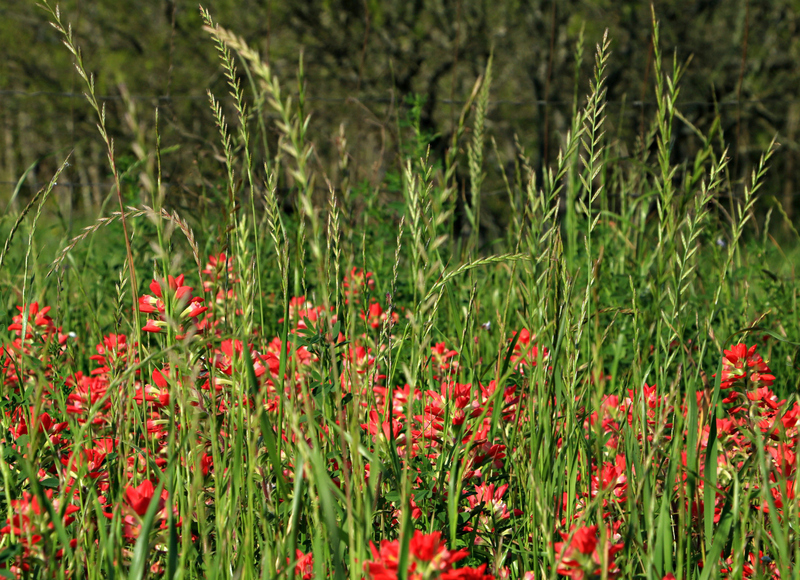 But on our back country roads, I find myself equally attracted to the fencelines, where the flowers — tangled, half-hidden by rising grasses, often ragged or beginning to fade — present a different sort of picture. Despite the risks of repetition, I’m including this brief introduction from the first post in this series as a word of explanation for readers who might have missed it. Tell me of what plant-birthday a man takes notice, and I shall tell you a good deal about his vocation, his hobbies, his hay fever, and the general level of his ecological education. The buds are bursting in Texas, and I’m doing my best to heed their arrival. To share my enjoyment of the season, I’ve decided to offer a short series of posts highlighting some of our local plant-birthdays. I hope you enjoy them, too. When the first of this season’s pink evening primroses began to unfurl, a delighted friend took notice. “Look!” she said. “Buttercups!” I’d always thought of buttercups as yellow, but she learned ‘buttercup’ as the common name for Oenothera speciosa — a pretty pink or white ground-hugging flower that carpets roadsides and fields beginning in February, and lasting well into summer. 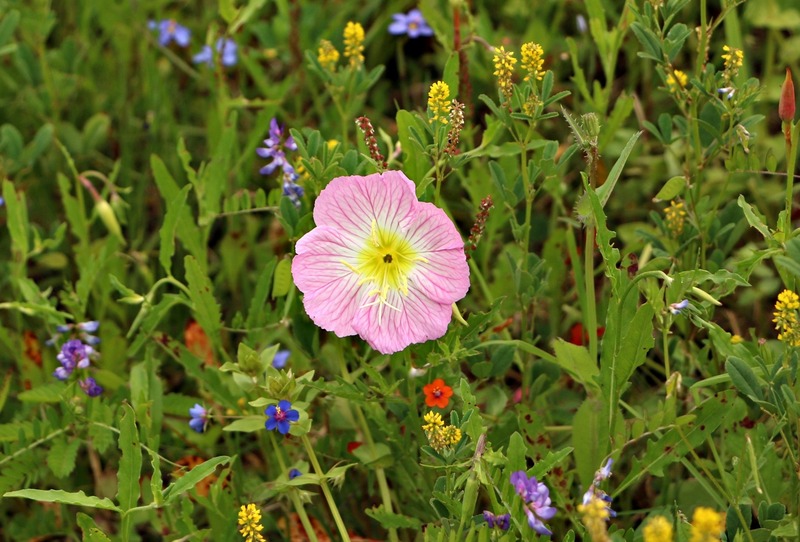 Other common names include Mexican evening primrose, showy evening primrose, and pink ladies, but a pink evening primrose by any other name remains a widespread complement to our bluebonnets and Indian paintbrush, willing even to colonize urban construction sites and traffic medians. 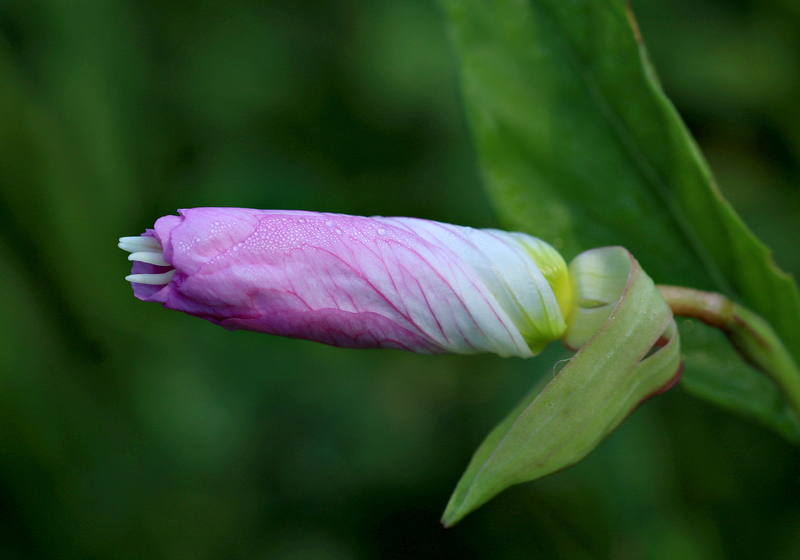 In some locations, these flowers open in the evening, although ours prefer the morning. 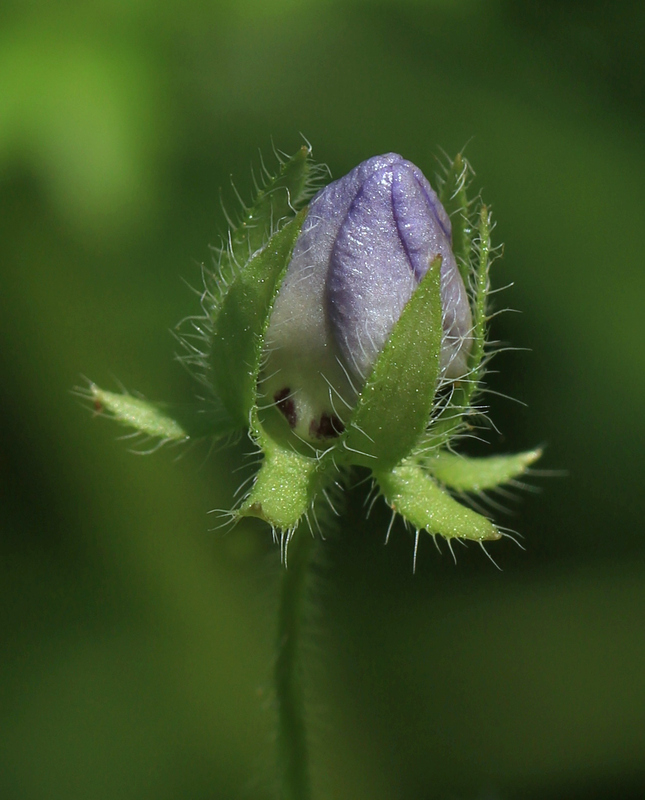 When I found this dew-touched bud south of Gonzales early on the morning of March 21, it looked for all the world as though it was poking its stigma out into the world to see if the time to unfurl had come. Impressive as fields of these flowers can be, this single Brazoria County blossom reminds me of Henri Rousseau’s jungle paintings. Every time I look at the image, I expect to find a tiny tiger or monkey hidden within in its depths. The buds are bursting in Texas, and I’m doing my best to heed their arrival. To share my enjoyment of the season, I’ve decided to offer a short series of daily posts highlighting some of our local plant-birthdays. I hope you enjoy them, too. 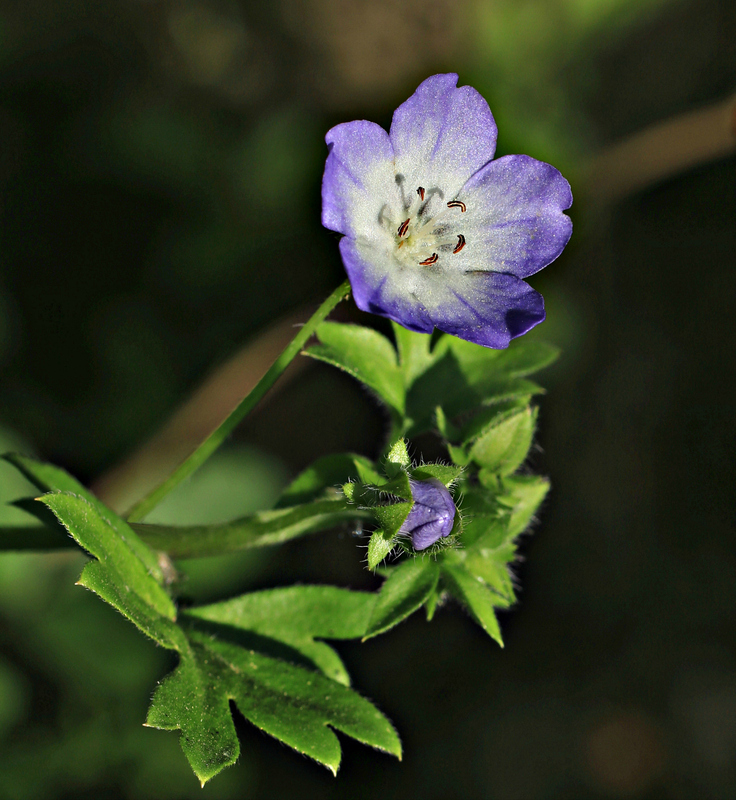 Previously a member of the waterleaf family (the Hydrophyllaceae), the plant known as Texas baby blue eyes (Nemophila phacelioides) has been moved by the taxonomists into the Boraginaceae. 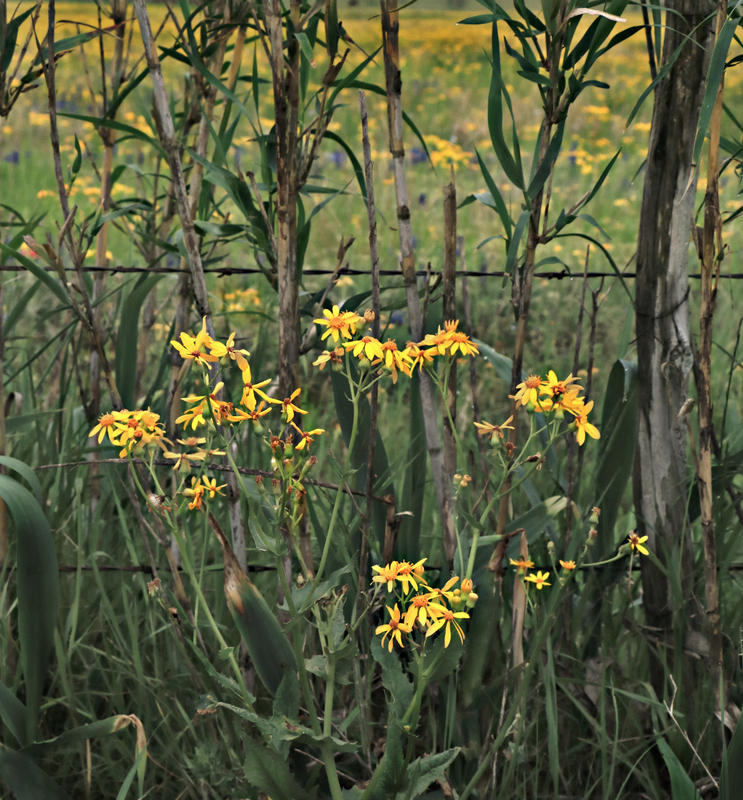 Native to Louisiana, Oklahoma, and Arkansas, as well as to Texas, the flowers often are found along woodland edges or stream banks; both characterize Piano Bridge Road outside Schulenburg, Texas, where I found a large, spreading colony of the flowers on March 21. Their three-month season ends in May, when temperatures begin to rise. Until then, their just slightly frosted petals make a lovely and colorful addition to the countryside.